Craving something crispy, crunchy and cheesy? We’ve got you covered with our Cheese Pizza Kale Chips. They’re dairy-free and you’ll never know. I do love a good slice or two of pizza. Cheesy, comfort food goodness! Who doesn’t?! I also thoroughly enjoy a good salty and crunchy chip. You too?! 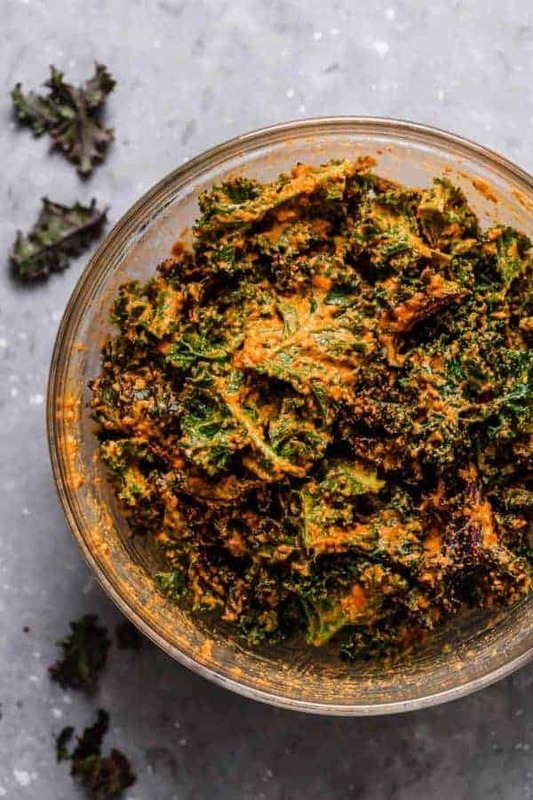 Well, today is your day because I’m sharing a nutritious and delicious healthy snack recipe inspired by these two crave-worthy foods with the main ingredient of this recipe being a nutrient-powerhouse food…KALE! Not a kale fan (yet)? Read a bit more before you turn your nose up! These are a must-try cheesy snack – without the cheese – and you might surprise yourself and your taste buds. 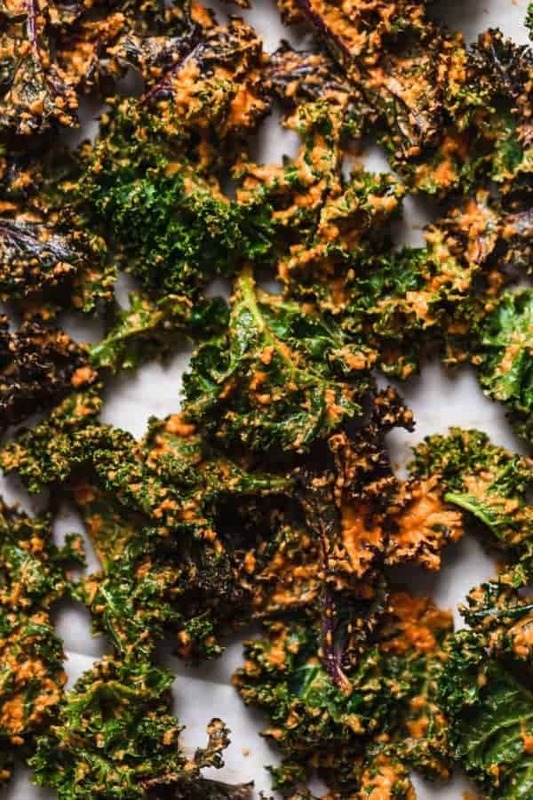 These Cheese Pizza Kale Chips are savory, simple and perfectly crispy. Best of all, there’s a bonus that comes with these chips. Next up, we have kale. 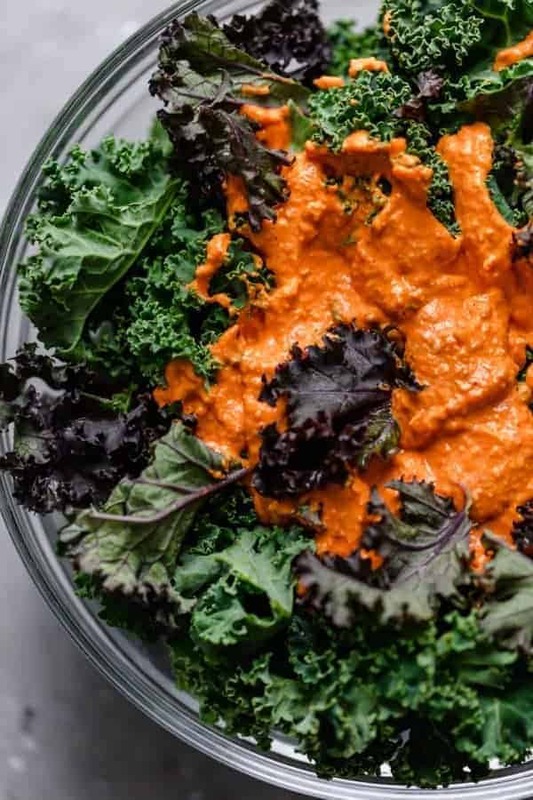 I personally love kale in all forms including our Massaged Kale Salad, Kale & Sweet Potato Sauté, Thai Kale Salad, BBQ Ranch Chopped Salad with Kale and kale chips. It’s truly a nutrient powerhouse. In fact, it’s known to be one of the healthiest foods on the planet. In just 1 cup it contains 3 grams of protein, 2 grams of fiber and only 33 calories. Fun fact: Per ounce it has more protein than a steak! I could go on and on about this incredibly nutrient-dense vegetable. In short, eat the kale! Nutritional yeast is the secret in the sauce. 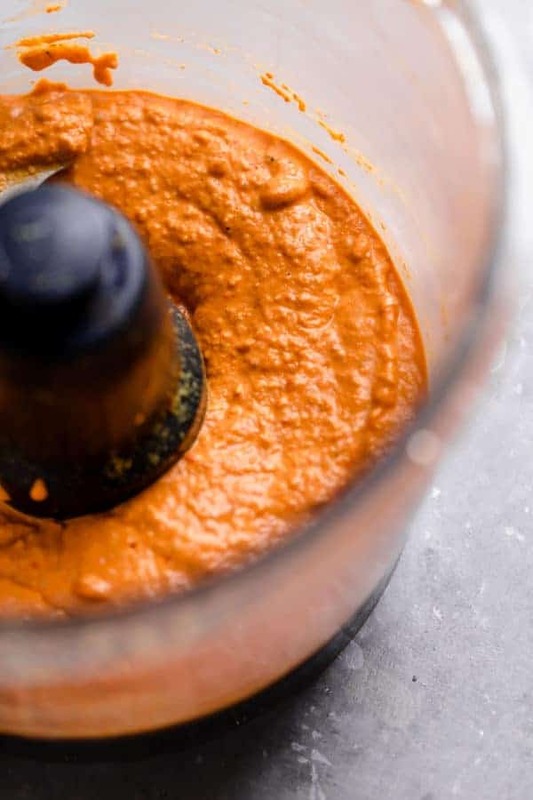 Blending nutritional yeast with the soaked cashews, roasted peppers, Italian seasonings, makes for a smooth, creamy and delicious sauce that has a close resemblance to cheese. This sauce also tastes great when tossed with vegetables or one of our favorites, zucchini noodles. Or you can try our Nacho Cheese Sauce (so good topped on a burrito bowl) or Dairy-Free Chicken Alfredo (a popular recipe on the blog). Both made with a similar ingredient profile. As mentioned above, nutritional yeast is a popular ingredient in the vegan diet or those that follow a dairy-free or paleo diet. You get your “cheesy” fix, and a nutritious boost, too! Additional ways you can enjoy nutritional yeast include sprinkling it on roasted veggies, on an omelet, on a salad, on tacos, or on roasted potatoes. My favorite nutritional yeast is Pure Natural Non-Fortified Nutritional Yeast Flakes by Sari Foods. 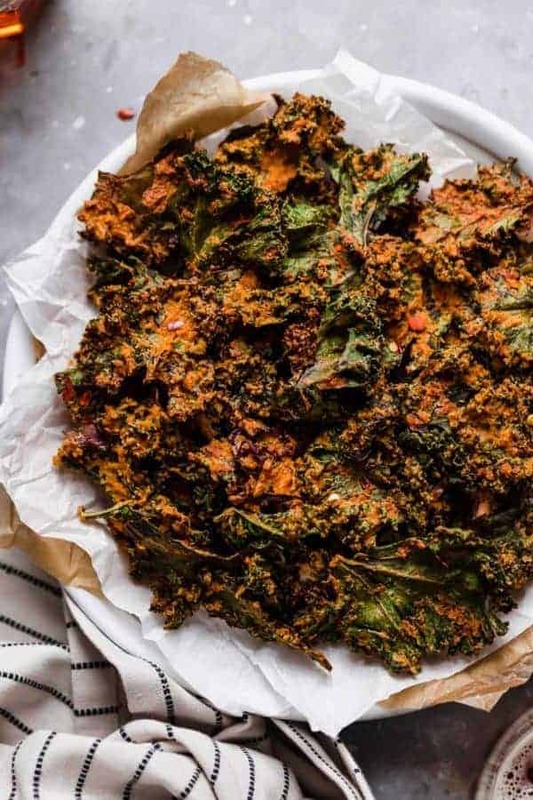 Slow and steady wins the race… Or in this case, produces the perfect, crunchy kale chip. In order for the cheese sauce and kale chips to become crispy vs. not wet and soggy, it’s crucial that you bake the kale chips low and slow. 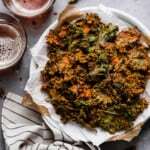 The long baking time and low temperature dehydrates the kale as well as the sauce and makes for the perfectly crispy, mouth watering, cheesy kale chip. When stored in an air-tight container, the kale chips will crispy for the day to come…if they last that long. 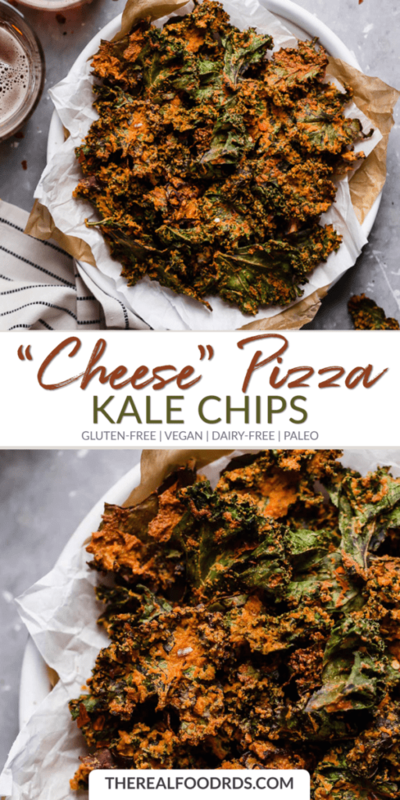 We hope you love these Cheese Pizza Kale Chips as much as we do! This recipe is gluten-free, dairy-free, paleo, vegan and Whole30-friendly. 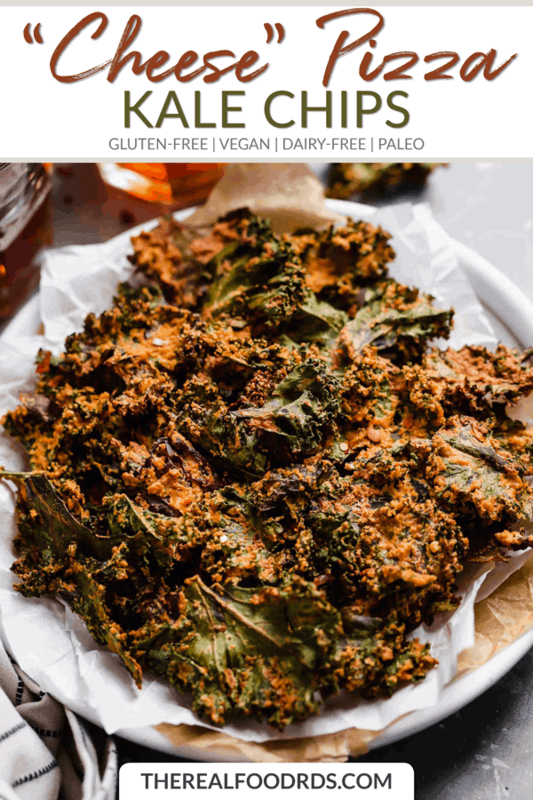 Paleo and vegan-friendly Cheese Pizza Kale Chips are a must-try, cheesy recipe – without the cheese! And you’ll never know the cheese is missing because they’re that good. Preheat oven to 200ºF. Line 2 large baking sheets with parchment paper, set aside. Wash the kale and pat dry. Remove the stems by tearing kale off into large, palm-sized leaves and place in a large bowl. Discard the stems or add them to smoothies. In a food processor or high-powered blender, make the cheese sauce by processing the remaining ingredients (not the kale) together until smooth. This may take a few minutes and you may need to scrape the sides of your food processor or blender during this step. The sauce will be thick. Add the sauce to the bowl of kale leaves and massage kale and sauce together until leaves are evenly coated. Single layer the kale leaves on two large baking sheets. Bake for 1 hour. Flip and bake for another 30-40 minutes or until dry and crispy. *To soak the cashews. Place 2 cups of cashews in a bowl. Add enough water to the bowl to cover the cashews. Allow to soak overnight or for at least 4 hours. Drain and rinse.